Thanks to AToMR Book Blog Tours for letting me be a part of this tour! I've an interview with Kate Avery Ellison followed by a giveaway for you guys today. You can check out the rest of the stops here. Frost (The Frost Chronicles #1) by Kate Avery Ellison. Publication : April 18th, 2012 (Self-Published). you write your first novel? I’ve always been writing. I wrote my first “book” (it had a cover, a table of contents, and three chapters, each a page in length) at age eight. Brooke Temer and the Secret Room ended up being the first in a mystery series that spanned thirteen books of similar length, and it was heavily influenced by my childhood obsession, the Nancy Drew series. I finished my first real novel, a vampire love story set in outer space, at age twenty one. 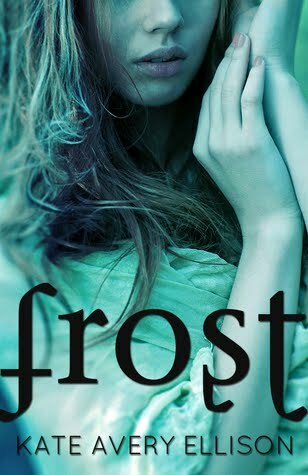 Tell us a bit about Frost, how is it different from your other books? All my books have a bit of mystery (I can’t seem to get away from my mystery-loving childhood roots! ), but this is the first one that has a really suspenseful undertone, I think, with the creatures in the forest and the threat of Farthers just across the river and the ever-present threat of the brutal cold. It’s also my first published novel that blends elements of both fantasy and sci fi, as the series is a little bit dystopian in nature and gets more so as the series goes on. If you had to describe Frost in one word, what would it be? Blue – maybe that’s cheating, since the cover is blue, but when I think of the story in my mind’s eye, it’s all soft light and shifting shadows and gathering darkness in various shades of blue. The cover's gorgeous! Did you pick it out? Originally, I planned to write four, but plans change. I’m now anticipating possibly five books in the main storyline that follows the main protagonist Lia Weaver, and I’m itching to write a companion novel from her best friend Ann’s perspective. I might even write a book from the point of view of Lia’s little sister, Ivy. (Both have very important roles later in the series, and I think people might enjoy reading what happens on their end, since the first person POV does limit the story, and a lot of cool things both characters do aren’t seen in the main series, just heard about later. But we’ll see. That’s all kind of up in the air right now. I vastly prefer writing in first person, probably because I find it easier to connect with the voice of the main character. When it comes to reading I have no preference, although I seem to read more first person books these days. Most of my favorite books are in third person, though. I’m now able to write full-time, and I spend a lot of time doing that, but when I’m not doing one of the various writing-related parts of the job (drafting, editing, marketing, etc. ), I’m usually creating some kind of digital art. I’m really interested in both photo manipulation and photography. I also designed all my book covers, so those are another example of my art. When I’m not writing or taking photographs or designing stuff in Photoshop, I can probably be found reading, watching one of my favorite TV shows, or scouring thrift stores for amazing deals. What's your favorite genre to read/write? Hmm, hard question! I like writing fantasy best, but I probably prefer to read sci fi. It’s a tough call, though, because most of my favorite books are either fantasy or historical. Thank you Kate, for answering my questions! My favorite book is The Book Thief by Markus Zusak! My favourite book is Pride and Prejudice by Jane Austen. Love love love that book. It helps me to know about this kindleandme.com. It is very helpful in using social media sites.its a Valiable site for all the people .I always like this website .You have been shown importance topic in your content. It will inspire me always. This is very nice post! I will bookmark this blog as I have The offshore is a must do for many Cairns guests, and though you can be a aspect of the viewers of many others and take a guest vessel out for a day of scuba diving leap scuba diving leap scuba diving leap scuba diving leap scuba diving scuba diving leap scuba diving leap scuba diving leap scuba diving scuba diving leap scuba diving leap scuba diving, you can also get involved in some actual SCUBA diving leap scuba diving leap scuba diving leap scuba diving scuba diving leap scuba diving leap scuba diving. Choices broad variety from personal day for Cairns Tours to several day live-aboard trips such as start water and evening goes.